The Greenview Village Board met for a regular scheduled board meeting on Monday, March 18, 2019. President Kevin Curry called the meeting to order at 7:00 p.m. and all present participated in the pledge of allegiance. The roll call indicated that Trustees, Patrick Feagans, Roy Lee, Sarah Heavner and Norman Hofmann were present. Other village personnel present were Zoning Officer, Chuck Ranson, and Village Treasurer Jerry Cottingham. Charlotte Wholer from Marbold Homestead informing of upcoming events and asking about possibly getting a water line to the farmstead. Discussion was had on what it would take to get water line out there. Discussion also had on allowing them to borrow barricades and cones for an upcoming event. Sidney Monroe was present to inform the board into a house that they rented and had to move because the house had black mold and sewer backflowing into the house and the landlord would not fix and has now posted the property for sale. They have contacted the Health Department and haven’t gotten a return call, asked if we could possible help getting the property condemned. Discussion was had and will be working with Chuck Ranson on this issue. Jerry Cottingham gave the treasurer report. A motion was made by Trustee Lee and seconded by Trustee VanCleve. Report approved and filed into record. Chuck Ranson gave the zoning report. Discussion was had a procedure for assessing fines. A motion was made by Trustee Hofmann and seconded by Trustee VanCleve to approve report. Report approved and filed into record. The minutes from the March 4th, 2019 board meeting were reviewed by each board member. A motion made by Trustee Heavner and seconded by Trustee Lee to approve the minutes. Minutes approved and filed in record. 1. Discussion was had on the information for spring clean up using Area disposal vs. Republic. Will put on the agenda for the next meeting. 2. Discussion was had on street signs, guys have taken down 26 signs and are taking them out to have them sandblasted. 3. A motion was made by Trustee Lee and seconded by Trustee VanCleve to hire Monica Brumm as a full-time Village Clerk starting May 1st. 1. Received transfer of property for Nelson Oil from Denise, has been delivered to Nelson Oil, once it is signed Denise will file at courthouse and it will be completed. 2. Discussion was also had on the transfer of property for the Parkhurst land. It is ready waiting to be signed. 3. 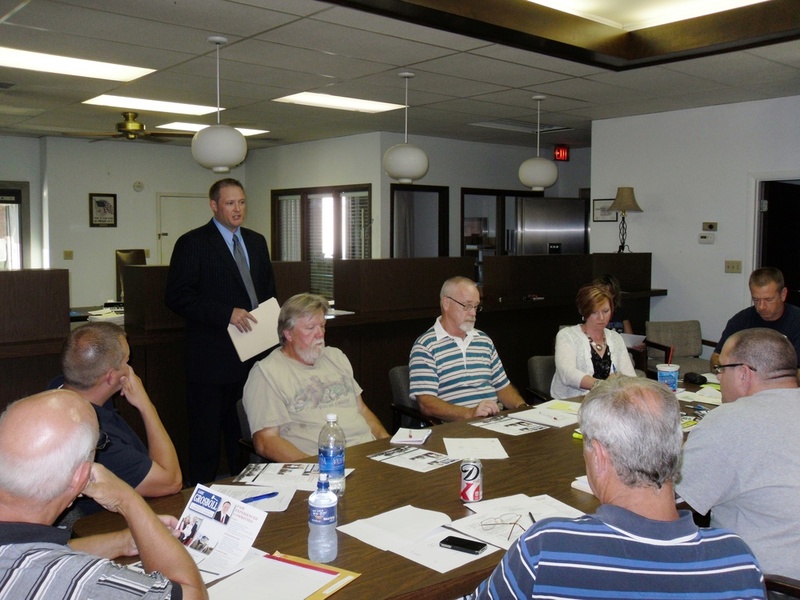 President Curry attended the Menard County Economic Development committee meeting. Thinks the Park Committee would benefit from attending the meetings. Trustee Hofmann: Park committee will be meeting March 25th to plan the Bingo Night and possible plans for recognition of donors. At the conclusion of all business, the announcement of the next meeting was made. The next meeting will be held on Monday April 1st, 2019 at 7:00 pm. The Greenview Village Board met for a regular scheduled board meeting on Monday, March 4, 2019. President Kevin Curry called the meeting to order at 7:00 p.m. and all present participated in the pledge of allegiance. The roll call indicated that Trustees, Patrick Feagans, Roy Lee, Joseph Wohler, Sarah Heavner and Norman Hofmann were present. Other village personnel present were Zoning Officer, Chuck Ranson, Village Treasurer Jerry Cottingham, and Village Clerk Monica Brumm. Ken Ratliff maintenance report has been tabled. John Holt gave the police report for the month of February. A motion was made by Trustee Lee and seconded by Trustee Hofmann to approve report. Report approved and filed into record. The minutes from the March 4th, 2019 board meeting were reviewed by each board member. A motion made by Trustee Wohler and seconded by Trustee Hofmann to approve the minutes. Minutes approved and filed in record. 1. Discussion was had on Leads on Line system. A motion was made was made by Trustee Feagans and seconded by Trustee Lee to purchase the Leads on Line system. 2. Discussion was had on surplus generators. 3. Discussion was had on a new street department building, discussion was had on finding possible grants. 4. Discussion was had on Ameren Bucket Truck Program. 1. Discussion was had the ordinance on stored cars. Discussion was had on turning abandon vehicles over to the police department. 2. Discussion was had a possible spring clean up day. Trustee Lee to work on pricing for dumpster. 3. Discussion on property that has possible septic issue and what Village can do legally. 5. Discussion on if Ameren will come around and clean up tree limbs that had been cut. Trustee Feagans: Discussion was had on if had a policy if someone hit a water line who paid for the damages, if a Julie had been called in. Trustee Wohler: Discussion was had on when Christmas decorations would be coming done and possible solution for the leaves on the drains. Trustee Lee: Discussed job description for the Village Clerk position. Trustee Hofmann: The employees got upgraded iPhone with the Verizon Government program at no cost to the Village. Updated on the park committee happenings. At the conclusion of all business, the announcement of the next meeting was made. The next meeting will be held on Monday March 18, 2019 at 7:00 pm. The Greenview Village Board met for a regular scheduled board meeting on Monday, February 4, 2019. President Kevin Curry called the meeting to order at 7:00 p.m. and all present participated in the pledge of allegiance. The roll call indicated that Trustees, Patrick Feagans, Roy Lee, Joseph Wohler, Sarah Heavner and Raymond VanCleve were present. Other village personnel present were Zoning Officer, Chuck Ranson, Village Treasurer Jerry Cottingham, and Village Clerk Monica Brumm. Jerry Cottingham gave the treasurers report for January. A motion was made by Trustee Feagans and seconded by Trustee Lee to approve report. Report approved and filed into record. Chuck Ranson gave the zoning report for January. A motion was made by Trustee Heavner and seconded by Trustee Lee to approve report. Report approved and filed into record. The minutes from the February 4th, 2019 board meeting were reviewed by each board member. A motion made by Trustee VanCleve and seconded by Trustee Wohler to approve the minutes. Minutes approved and filed in record. 1. Discussion was had on replacing or repainting street signs. 1. Discussion was had on someone that was interested in the old conference table. 2. Discussion was had on a church wanting to donate 41 metal chairs and cart to the Village. It was decided that the Village could not use them but would check with the CIA to see if they were interested. Meeting then went into executive session. Executive session ended. A motion was made by Trustee Lee and seconded by Trustee VanCleve to approve the minutes from executive session. Discussion was had on sewer project and update from the engineers. At the conclusion of all business, the announcement of the next meeting was made. The next meeting will be held on Monday March 4, 2019 at 7:00 pm. The Greenview Village Board met for a regular scheduled board meeting on Monday, February 4, 2019. President Kevin Curry called the meeting to order at 7:00 p.m. and all present participated in the pledge of allegiance. The roll call indicated that Trustees, Patrick Feagans, Roy Lee, Joseph Wohler, Norman Hofmann, Sarah Heavner and Raymond VanCleve were present. Other village personnel present were Village Employee Ken Ratliff, Police Chief John Holt, Village Treasurer Jerry Cottingham, and Village Clerk Monica Brumm. Ken Ratliff gave the maintenance report for January. A motion was made by Trustee Lee and seconded by Trustee Wohler to approve report. Report approved and filed into record. John Holt gave the police report for January. A motion was made by Trustee Hofmann and seconded by Trustee Feagans to approve report. Report approved and filed into record. The minutes from the January 21, 2019 board meeting were reviewed by each board member. A motion made by Trustee Heavner and seconded by Trustee Lee to approve the minutes. Minutes approved and filed in record. 1. Discussion was had on reviewing Executive Session minutes, there have been no executive sessions in the last six months, that have to be reviewed. 2. Discussion was had on Grant Finder Account Authorization. A motion was made by Trustee VanCleve and seconded by Trustee Lee to put Trustee Hofmann in charge of the Grant Finder account. 3. Discussion was had on lighted Christmas decorations around the square. 4. An update was given on the sewer system that the Engineers would be in town this week looking around and we would receive updates on progress every two weeks from Woodard & Curran. 1. Trustee Hofmann has sent in the request for the Ameren donation of a used bucket truck. Trustee Feagans: Spoke to Mark Becker regarding street signs. $65 per hour to include blasting, epoxy primer and base primer would have to have someone paint letters. A motion was made by Trustee Lee and seconded by Trustee Wohler to do 25 signs to start and see how it went. All present in favor, voted aye. Motion passed. Trustee Wohler: Got in touch with Doug Flanders to get the monument bench moved back once the ground is solid. Also, the Donation check from Landmark Illinois is on the way. Trustee Lee: Checked with the guys and they have all the tools needed to do some concrete. And gave update on plans for the employees the next month. Trustee Hofmann: The park committee is continuing on working on raising money to pay back for the mulch and other fund raisers for more park equipment in the future. At the conclusion of all business, the announcement of the next meeting was made. The next meeting will be held on Monday February 18,2019 at 7:00 pm. The Greenview Village Board met for a regular scheduled board meeting on Monday, November 19, 2018. President Dan Horn called the meeting to order at 7:00 p.m. and all present participated in the pledge of allegiance. The roll call indicated that Trustees, Patrick Feagans, Roy Lee, Norman Hofmann, Kevin Curry and Raymond VanCleve were present. Other village personnel present were Village Zoning Office Chuck Ranson, Village Treasurer Jerry Cottingham, and Village Clerk Monica Lynn. Jerry Cottingham gave the treasurer’s report for October. A motion was made by Trustee Curry and seconded by Trustee Lee to approve report. Report approved and filed into record. Chuck Ranson gave the zoning report for October. A motion was made by Trustee Feagans and seconded by Trustee Hofmann to approve report. Report approved and filed into record. The minutes from the November 5, 2018 board meeting were reviewed by each board member. A motion made by Trustee Lee and seconded by Trustee Curry to approve the minutes. Minutes approved and filed in record. 1. A motion was made by Trustee Hofmann and seconded by Trustee Lee to approve the purchase of safety bollards from U-line for $267 each plus shipping. Was roll called, all present in favor voted aye. 2. A motion was made by Trustee Feagans and seconded by Trustee Curry to approve the purchase of the StarCom 21 radio system for both a handheld and in-car system. Was roll called, all present in favor voted aye. 3. Discussion was had on the FFA community project to plant an evergreen in the park. Knob Hill will be planting the tree on the south corner. The FFA will pay for the material to get electricity over to the tree. Will come the week after Thanksgiving. A dedication ceremony will be December 15th at 5 pm. 1. A motion was made by Trustee Lee and seconded by Trustee Feagans to approve Ordinance 535 – Road District Tax Levy for May 1, 2018-April 30, 2019. All present in favor voted aye. 2. A motion was made by Trustee Feagans and seconded by Trustee Hofmann to approved Ordinance 536 – Corporate Tax Levy for May 1, 2018-April 30, 2019. 3. A motion was made by Trustee Lee and seconded by Trustee VanCleve to approve gift cards to employees. Was roll called, all present in favor voted aye. Trustee Curry: Spoke with Sterling Adams said would be approximately $60 per bench to build park benches. Will be checking to see about delivery. Trustee Feagans: Discussion was had on the second truck that is at Salt Creek. Trustee Feagans will check on it. Trustee Hofmann: Park committee is still working on fundraisers to help pay off the mulch for the park. The school had a walk-a-thon and raise $900 for the park committee. The Greenview Village Board met for a regular scheduled board meeting on Monday, November 5, 2018. President Dan Horn called the meeting to order at 7:00 p.m. and all present participated in the pledge of allegiance. The roll call indicated that Trustees, Patrick Feagans, Joseph Wohler, Norman Hofmann, Kevin Curry and Raymond VanCleve were present. Other village personnel present were Village Employee Ken Ratliff, Police Chief John Holt, Village Treasurer Jerry Cottingham, and Village Clerk Monica Lynn. Jason Huffman with the Sheriff’s Office presented a new radio system and costs for Menard County. Board will discuss and vote on at the next meeting. Ken Ratliff gave the maintenance report for October. A motion was made by Trustee Wohler and seconded by Trustee Curry to approve report. Report approved and filed into record. John Holt gave police report for October. A motion was made by Trustee Hofmann and seconded by Trustee Feagans to approve report. Report approved and filed into record. The minutes from the October 15th, 2018 board meeting were reviewed by each board member. A motion made by Trustee Curry and seconded by Trustee Wohler to approve the minutes. Minutes approved and filed in record. 1. Discussion was had on the location for the evergreen tree in the park being donated by the FFA. 2. Discussion was had on possible purchase of removable bollards on the new sidewalk at the arch to prevent from people driving on unless they have permission. Approximate cost is $130 each, will be voted on at the next meeting. 3. Discussion was had on the placement of the recycle dumpster project by the High School Eco Club. Trustee Hofmann will be getting more information on the project. 1. A motion was made by Trustee Curry and seconded by Trustee Wohler to approve paying the IML insurance bill in full with the 1% discount. Motion was roll called, all present in favor voted aye. 2. Trustee was approached about getting new park benches being built by Canton Prisioners. Will be getting more information on the program. 3. President Horn recommended that the board purchase a new voice recorder. 4. President Horn received a call from Bob Barker at Middletown Bank, the will not provide the interim financing. Has reached out to Athens State Bank and should have an answer by November 13th. 5. Discussion was had on the urinal in the men’s restroom at Village Hall needs repaired. Will be contacted Hernen’s to fix. At the conclusion of all business, the announcement of the next meeting was made. The next meeting will be held on Monday November 19th, 2018 at 7:00 pm. The Greenview Village Board met for a regular scheduled board meeting on Monday, October 15th, 2018. President Dan Horn called the meeting to order at 7:00 p.m. and all present participated in the pledge of allegiance. The roll call indicated that Trustees, Patrick Feagans, Roy Lee, Joseph Wohler, Norman Hofmann, Kevin Curry and Raymond VanCleve were present. Other village personnel present were Village Zoning Officer Chuck Ranson, Police Chief John Holt, Village Treasurer Jerry Cottingham, and Village Clerk Monica Lynn. Auditors from Estes, Bridgewater & Ogden were present and presented the final audit for the 2017/2018 year. Don Fontaine with Stone River Group was present and presented electrical aggregation rates for the upcoming year. Recommended that we go with a 36-month contract with AEP since rates are low. A motion was made by Trustee Lee and seconded by Trustee Curry to accept a 36-month contract with AEP at a rate of .4987 for the next 3 years. Approval of the contract was roll called, all present in favor voted aye. Motion passed. Lindsi Kane – With Greenview High School Eco Club discussed with the board regarding getting a recycling dumpster for the community. Discussion was had, and the council will investigate where it could be placed and have an answer at the November 5th meeting. Greenview School Superintendent, Ryan Heavner was present discussing the 1% Sales Tax Referendum that will be on April’s ballot and the reasoning behind it and what it would be used for. Mr. Whitcomb was present regarding purchasing the lot at 204 W. Jefferson Street, was advised that the Village would have to publish the intent to sale the property in the paper for 3 weeks before accepting bids on it. Trustee VanCleve will be getting with the Village attorney to get that published. Jerry Cottingham gave the treasurer’s report for September. A motion was made by Trustee Lee and seconded by Trustee VanCleve to approve report. Report approved and filed into record. Chuck Ranson gave the zoning report for September. A motion was made by Trustee Hofmann and seconded by Trustee Feagans to approve report. Report approved and filed into record. The minutes from the October 1st, 2018 board meeting were reviewed by each board member. A motion made by Trustee Curry and seconded by Trustee VanCleve to approve the minutes. Minutes approved and filed in record. Income/Expense/Bill Report- The bills were reviewed by each board member. An addition of a check to Estes, Bridgewater & Ogden for audit was added to the bills. Approval of the income/expense report with additions was roll called, all present in favor voted aye. Filed into record. 1. Discussion was had on the sidewalk around the Memorial Arch needing dirt against the sides. Trustee Hofmann will be checking into sources to get dirt to fill in. 2. Discussion was had on placing a time capsule next to the arch. Trustee Hofmann will be researching ideas for that. 3. Discussion was had on purchasing “No Soliciting Stickers”. Trustee Hofmann will be researching pricing for that. 1. Discussion was had on renewing the Menard County Animal Control contract. The contract was for $1913.70 for the year, which was the same price as last year. A motion was made by Trustee Lee and seconded by Trustee Feagans to accept the contract. The motion was roll called and all present in favor voted aye. Contract accepted. 2. Discussion was had on purchasing new tires for the police squad car. A bid of $1186.52 was given from Glenn Tuttle Service. A motion was made by Trustee Curry and seconded by Trustee Feagans to accept the bid. The motion was roll called and all present in favor voted aye. Bid accepted. 3. Discuss was had on replacing a new electrical box in the pump house for the power for the pavilion. An estimate was given for $995.00 by Montgomery Electric. A motion was made by Trustee Wohler and seconded by Trustee Lee to accept Montgomery Electric’s bid. The motion was roll called, all present in favor voted aye. Bid accepted. 4. Discussion was had on purchasing a new seat for the village truck. Trustee Lee will get with the employees to have them get a bid on it. Trustee Wohler: Discussion was had on paying Mr. Martin a rental fee for the use of his skidsteer and auger for the playground equipment. A motion was made by Trustee Curry and seconded by Trustee Lee to pay $150 for rental fees. The motion was roll called, all present in favor voted aye. Motion passed. Trustee Lee: The employees were given a washer/dryer for free and want to hook it up at the building. Will cost approximately $275 to get that done. A motion was made by Trustee VanCleve and seconded by Trustee Lee to approve the employees to spend $275 to hook up washer and dryer. Motion was roll called, all present in favor voted aye. Motion passed. Trustee Hofmann: Contacted IML insurance and new playground equipment is now covered with no increase in rates. Gave update on the installation of the playground and how smoothly it went. They will now need to have approximately $8000 for the ground cover and so far, have enough for half of it. The volunteer park committee would like to borrow money from the general fund to finish the project and they will continue to have fund raisers to pay back the money. A motion was made by Trustee Lee and seconded by Trustee VanCleve to approve loaning the money to the park fund from the general fund. Motion was roll called, all present in favor voted aye. Motion passed. President Horn: President Horn turned in a letter of resignation effective as of 12/31/18. Discussion was had on the process of filling his position for the final 2-years of his term. At the conclusion of all business, the announcement of the next meeting was made. The next meeting will be held on Monday November 5th, 2018 at 7:00 pm. The Greenview Village Board met for a regular scheduled board meeting on Monday, October 1st, 2018. President Dan Horn called the meeting to order at 7:00 p.m. and all present participated in the pledge of allegiance. The roll call indicated that Trustees, Patrick Feagans, Roy Lee, Joseph Wohler, Norman Hofmann, Kevin Curry and Raymond VanCleve were present. Other village personnel present were Village Employee Ken Ratliff, Police Chief John Holt, Village Treasurer Jerry Cottingham, Zoning Officer Chuck Ranson, and Village Clerk Monica Lynn. Ken Ratliff gave the maintenance report for September. A motion was made by Trustee Curry and seconded by Trustee Wohler to approve report. Report approved and filed into record. John Holt gave the police report for September. A motion was made by Trustee Wohler and seconded by Trustee Hofmann to approve report. Report approved and filed into record. The minutes from the September 17th, 2018 board meeting were reviewed by each board member. A motion made by Trustee Feagans and seconded by Trustee Curry to approve the minutes. Minutes approved and filed in record. 1. Discussion was had on the zoning committee amending the sign ordinance. It was recommended that residents may advertise their business at their residence as long as the style is a wall sign, it can have no electrical enhancement, maximum size is no bigger that 4 square feet and can be no higher than 6 ft. from the top of the sign to ground level. A motion was made by Trustee Lee and seconded by Trustee Hofmann to amend the sign ordinance. All present in favor voted aye. Filed into record. 1. A motion was made by Trustee Lee and seconded by Trustee Wohler to get an estimate for tire replacement on the squad car. A vote will be done at the next meeting. Trustee Wohler: Concrete for the arch has been torn out and will be poured and finished this week sometime. Discussion was had on Janssen donating labor. Also wanted the board to know that Tom Justice donated hauling rock for the rock. Also updated the board that the grant money for the Arch is in the process, there may be a few things that Landmark Illinois will need before the process is complete. Trustee Hofmann: Gave update on playground equipment installation. Also brought up the possibility of placing a time capsule in the park. Discussion was had on it. Discussion was also had on rules of letting Labor Day vendors and other people drive on the concrete of the Arch. At the conclusion of all business, the announcement of the next meeting was made. The next meeting will be held on Monday October 15th, 2018 at 7:00 pm. The Greenview Village Board met for a regular scheduled board meeting on Monday, September 17th, 2018. President Dan Horn called the meeting to order at 7:00 p.m. and all present participated in the pledge of allegiance. The roll call indicated that Trustees, Patrick Feagans, Joseph Wohler, Norman Hofmann, Kevin Curry and Raymond VanCleve were present. Other village personnel present were Village Employee Ken Ratliff and Trey Castles, Village Treasurer Jerry Cottingham, Zoning Officer Chuck Ranson, and Village Clerk Monica Lynn. Mr. Alexander was present, and discussion was had on the sign promoting his business on his shed. Mr. Heavener & Mr. Hilt from the Greenview School district were present and have received a grant for a community project and they would like to plant a live community Christmas tree in the park along with having benches. The school will be responsible for planting and maintaing the tree, and for decorating at the holidays. Discussion was had on location and requirements. Chuck Ranson gave the zoning report for August. A motion was made by Trustee Curry and seconded by Trustee VanCleve to approve report. Report approved and filed into record. Jerry Cottingham gave the treasurer report for August. A motion was made by Trustee Feagans and seconded by Trustee Hofmann to approve report. Report approved and filed into record. Ken Ratliff gave the maintenance report for August. A motion was made by Trustee Wohler and seconded by Trustee VanCleve to approve report. Report approved and filed into record. The minutes from the September 10th, 2018 board meeting were reviewed by each board member. A motion made by Trustee Feagans and seconded by Trustee Hofmann to approve the minutes. Minutes approved and filed in record. Income/Expense/Bill Report- The bills were reviewed by each board member. And addition to the Road District bills was added for Janssen Concrete for sidewalk replacements. Approval of the income/expense report with additions was roll called, all present in favor voted aye. Filed into record. 1. Discussion was had on the concrete for the Memorial Arch. Janssen Concrete will donate the labor with the Village paying for the materials. Old concrete will be removed and hauled away, and new concrete poured. Discussion was had on the time frame. Trustee Wohler will be in contact with Janssen Concrete to schedule. 2. 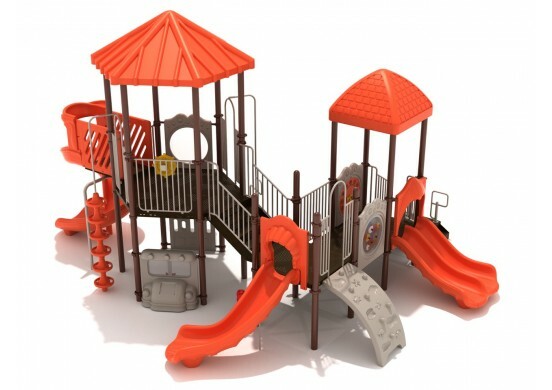 Discussion was had on the new playground equipment, will be delivered Friday and installed over the weekend, September 22-23rd. 1. Discussion was had on a new location of sewer plant, will involve trading properties and closing off a street there at Brandt. Was discussed with the engineers and they will work. A motion was made by Trustee Curry and seconded by Trustee Wohler to proceed with the new location. All present in favor voted aye. Motion approved. 2. Discussion was had on the zoning ordinance regarding advertising a resident’s business on their personal properties. The Zoning committee will be meeting to look at the ordinance. Trustee Feagans: Sidewalks are done for the year. Janssen Concrete donated the bump pads on the new sidewalks. Trustee Hofmann: Brought up possible fall clean-up day. Discussion had and decided to wait until spring. At the conclusion of all business, the announcement of the next meeting was made. The next meeting will be held on Monday October 1st, 2018 at 7:00 pm. The Greenview Village Board met for a regular scheduled board meeting on Monday, September 10th, 2018. President Dan Horn called the meeting to order at 7:00 p.m. and all present participated in the pledge of allegiance. The roll call indicated that Trustees, Patrick Feagans, Roy Lee, Joseph Wohler, Norman Hofmann, Kevin Curry and Raymond VanCleve were present. Other village personnel present were Police Chief John Holt, Village Treasurer Jerry Cottingham, and Village Clerk Monica Lynn. Mr. Alexander was present and presented to the board a concern with a letter received. John Holt gave police report for August. A motion was made by Trustee Lee and seconded by Trustee Wohler to approve report. Report approved and filed into record. The minutes from the August 20th, 2018 board meeting were reviewed by each board member. A motion made by Trustee Lee and seconded by Trustee Feagans to approve the minutes. Minutes approved and filed in record. Income/Expense/Bill Report- The bills were reviewed by each board member. Approval of the income/expense report was roll called, all present in favor voted aye. Filed into record. 1. Discussion was had on cause of electrical issues requiring service call in the park over the Labor Day festivities. Discussion was had on updating the fuse box in the pump house to switch from fuse type to breaker type. Trustee Feagans will get an estimate. 1. Ordinance #534 was voted on and passed, with all present in a favor voted aye. 2. A motion was made by Trustee Wohler, and seconded by Trustee Feagans, to have the Rt. 97 Cruisers participate in next year’s Labor Day Celebration at the same cost as this year. 3. President Horn informed the board that Superintendent Heavner and Principal Mr. Turner will be attending the next board meeting to speak with the board. 4. Discussion was had on what type of plaques will be added to the War Memorial and the criteria. Trustee Feagans: Sidewalk repairs are in the process. Discussion was had on the concrete repairs around the Memorial. Trustee Hofmann: Gave an update on the park committee’s fund-raising efforts. Was informed that there were two signed prints of Abraham Lincoln donated to the park committee to use to raise funds. At the conclusion of all business, the announcement of the next meeting was made. The next meeting will be held on Monday September 17th, 2018 at 7:00 pm. The Greenview Village Board met for a regular scheduled board meeting on Monday, August 20th, 2018. President Dan Horn called the meeting to order at 7:00 p.m. and all present participated in the pledge of allegiance. The roll call indicated that Trustees, Patrick Feagans, Roy Lee, Joseph Wohler, Norman Hofmann, Kevin Curry and Raymond VanCleve were present. Other village personnel present were Zoning Officer Chuck Ranson, Village Treasurer Jerry Cottingham, and Village Clerk Monica Lynn. Jerry Cottingham gave the Treasurers report for July. A motion was made by Trustee Wohler and seconded by Trustee VanCleve to approve report. Report approved and filed into record. Chuck Ranson gave zoning report for July. A motion was made by Trustee Curry and seconded by Trustee Lee to approve report. Report approved and filed into record. The minutes from the August 6th, 2018 board meeting were reviewed by each board member. A motion made by Trustee Lee and seconded by Trustee Feagans to approve the minutes. Minutes approved and filed in record. 1. Discussion was had on Citizen of The Year and will go to Mr. Rod Leamon. 2. Discussion was had on the policy and rates for debris removal. It is $25 per hour per man and $25 per hour per piece of equipment with a minimum of 1 hr. A sheet will be typed up and will be published on the website. 3. Discussion was had on getting rid of the Aramark Uniforms and purchasing shirts from Sangamon County Signs and Graphics and allowing employees to purchase blue jeans. 5. Discussion was had on the brick mason being done with the arch around the 26th of August, and the concrete will not be done in time for Labor Day, so discussion was held on what to do with the bench, will be checking with the fire house to see if can be stored there until the concrete work is finished. 1. Discussion was had on a possible revision to the Mobile Home Ordinance regarding the selling of a property with a vacant mobile home on it. The zoning officer will get in contact with the attorney to find out legalities of it and if the trailer is uninhabited will it fall under the Dangerous and Abandoned buildings ordinance. 2. The Village will be participating in the Labor Day Parade again. 3. President Horn received a call from a resident regarding the condition and lack of flags around the park. Possible that we have some flags already to replace the torn ones already and Trustee Lee will get with the employees to see what we have, and the Village will possibly purchase new ones if needed. 4. Discussion was had on the WWI Memorial Arch and re-dedication. Trustee Hofmann will be writing an article to put in the review to update on the progress. Also, the Amvets will be participating in the re-dedication ceremony and will be checking into a Memorial Wreath for the ceremony. 5. Discussion was had on making sure the roads will be cleared for the Labor Day Celebration and that it will not interfere with Sanert’s farm sale on 09/07/18. 6. Discussion was had on the next election would be 04/02/19. Petitions can be picked up after 09/18/18 and must be turned in December 10-17th, 2018. There will be 3 Trustee seats available. Trustee Wohler, Trustee VanCleve, and Trustee Lee’s terms will expire. Trustee VanCleve: They will be oiling the streets the first week after Labor Day. Checked into replacing the street signs it depends on the size of the sign but averages to about $24 per sign. Would need a total of 126 signs, with an approximate cost of $3000.00 They would be stickers on aluminum and high-vis signs. Discussion was had and will appropriate in the budget to replace a few signs at a time over the next 3 years. Discussion was also held about handicapped parking for the Labor Day Celebration. Trustee Feagans: Will be doing some sidewalks soon and will be putting the bump pads on the new sidewalks. At the conclusion of all business, the announcement of the next meeting was made. The next meeting will be held on Monday September 10th, 2018 at 7:00 pm. The Greenview Village Board met for a regular scheduled board meeting on Monday, August 6th, 2018. President Dan Horn called the meeting to order at 7:00 p.m. and all present participated in the pledge of allegiance. The roll call indicated that Trustees, Patrick Feagans, Joseph Wohler, Kevin Curry and Raymond VanCleve were present. Other village personnel present were Village Employee Ken Ratliff, Police Chief John Holt, Village Treasurer Jerry Cottingham, and Village Clerk Monica Lynn. Ken Ratliff gave report for July. A motion was made by Trustee Curry and seconded by Trustee Feagans to approve report. Report approved and filed into record. Police Chief John Holt gave police report for July. A motion was made by Trustee Wohler and seconded by Trustee VanCleve to approve report. Report approved and filed into record. The minutes from the July 16th, 2018 board meeting were reviewed by each board member. A motion made by Trustee Curry and seconded by Trustee VanCleve to approve the minutes. Minutes approved and filed in record. Income/Expense/Bill Report- The bills were reviewed by each board member. With the addition of bills to Ameren for the General Fund, and USPS for the water fund and an addition deposit for the water fund for July water sales. Approval of the income/expense report with the additions was roll called, all present in favor voted aye. Filed into record. 1. Discussion was had on the pricing for removal of tree limbs done by city employees. Will look up and set pricing at next meeting and have a sheet for the guys and will publish it on the website for residents. 1. Discussion was had on Citizen of The Year, will vote on the next meeting to give a little time for more nominees to come in. Trustee Wohler: Was informed by the brick mason that the bench under the arch will need to be moved. Village didn’t have the capability to move it, the brick mason will hire it done there will be an additional charge. Discussion was also had on adding additional war/conflict plaques to the Memorial Arch. The park committee is up to $20,827.09 in the park fund, they have also decided the monkey bars need to be removed for safety reasons, and they will be doing a Cosmic Bowling fund raiser 08/25/18 and will have the shotgun raffle on Labor Day. President: Discussion on having street sign posts painted and possibly replacing street signs. The Greenview Village Board met for a regular scheduled board meeting on Monday, July 16th, 2018. President Dan Horn called the meeting to order at 7:00 p.m. and all present participated in the pledge of allegiance. The roll call indicated that Trustees, Patrick Feagans, Roy Lee, Norman Hofmann, Kevin Curry and Raymond VanCleve were present. Other village personnel present were Zoning Officer Chuck Ranson, Village Treasurer Jerry Cottingham, and Village Clerk Monica Lynn. Jerry gave treasurers report for June. A motion was made by Trustee Feagans and seconded by Trustee Curry to approve report. Report approved and filed into record. Chuck Ranson gave the zoning report for June. A motion was made by Trustee Lee and seconded by Trustee VanCleve to approve report. Report approved and filed into record. The minutes from the July 2nd, 2018 board meeting were reviewed by each board member. A motion made by Trustee Curry and seconded by Trustee VanCleve to approve the minutes. Minutes approved and filed in record. Income/Expense/Bill Report- The bills were reviewed by each board member. With the addition of bills to Blue Cross Blue Shield and Landmark Illinois for the General Fund, and Hawkins Inc for the water fund. Approval of the income/expense report with the additions was roll called, all present in favor voted aye. Filed into record. 1. President Horn gave update on the Memorial Arch the brick mason should have someone here at the end of the week to start on the arch and it should take approximately 30 days to finish. The rededication for the Memorial Arch will be the Sunday of Labor Day. Times have not been set yet. 2. President Horn passed around a plate that Ed & Connie Wickham donated. It is a plate of the Memorial Arch from the 1950’s. 3. President Horn gave an update on the Sewer project. There was a meeting with the USDA representatives and the Village was approved for a 43% grant for the sewer project. That is the highest grant given by the USDA. Things are progressing, and a meeting will be set up with Bob Barker for interim financing. Trustee Hofmann: The playground equipment has been ordered and the Park Committee will be having a meeting within the next week. Also spoke with Ameren regarding their Community Service Program in which employees volunteer their time to help with community projects. The Park Committee has raised approximately $20,000. Had discussion on employee health insurance. Reported that the Village Insurance with IML has been submitted and is renewed. President: The Fire Department wants to block the street again for their Labor Day street fest. The will be having a band from 2-5 and 5-9. And allowing Taapers to sell beer like they did last year. At the conclusion of all business, the announcement of the next meeting was made. The next meeting will be held on Monday August 6th, 2018 at 7:00 pm. The Greenview Village Board met for a regular scheduled board meeting on Monday, June 18th, 2018. President Dan Horn called the meeting to order at 7:00 p.m. and all present participated in the pledge of allegiance. The roll call indicated that Trustees, Patrick Feagans, Roy Lee, Norman Hofmann, Kevin Curry and Raymond VanCleve were present. Other village personnel present were Village Zoning Office Chuck Ranson, Village Treasurer Jerry Cottingham, and Village Clerk Monica Lynn. Denise Barr opened the sealed bids for properties for sale. 220 S. Blaine - Crystal Janssen for $10,000.00: 355 E Adams - Jeremy Bacon for $2500.00. A motion was made by Trustee Lee and seconded by Trustee Feagans to accept the above bids. All present, in favor, voted aye. Motion approved. Jerry Cottingham gave treasurers report for May. A motion was made by Trustee Curry and seconded by Trustee VanCleve to approve report. Report approved and filed into record. Chuck Ranson gave the zoning report for May. A motion was made by Trustee Hofmann and seconded by Trustee Lee to approve report. Report approved and filed into record. The minutes from the June 4th, 2018 board meeting were reviewed by each board member. A motion made by Trustee Hofmann and seconded by Trustee Feagans to approve the minutes. Minutes approved and filed in record. 1. E-commerce sign is ready. Guys are going to paint fence before installing. 2. Discussion was had on the DOT paperwork and costs for road repairs for the year along with engineering fees. 3. A motion was made by Trustee Lee and seconded by Trustee VanCleve to approve Ordinance #529 Mediacom Franchise Fees. All present in favor voted aye. Ordinance passed and filed into record. At the conclusion of all business, the announcement of the next meeting was made. The next meeting will be held on Monday July 2nd, 2018 at 7:00 pm. The Greenview Village Board met for a regular scheduled board meeting on Monday, June 4th, 2018. President Dan Horn called the meeting to order at 7:00 p.m. and all present participated in the pledge of allegiance. The roll call indicated that Trustees, Patrick Feagans, Joseph Wohler, Norman Hofmann, Kevin Curry and Raymond VanCleve were present. Other village personnel present were Village Employee Ken Ratliff, Police Chief John Holt, Village Treasurer Jerry Cottingham, and Village Clerk Monica Lynn. Ken Ratliff gave monthly report for May. A motion was made by Trustee Curry and seconded by Trustee Wohler to approve report. Report approved and filed into record. John Holt gave the police report for May. A motion was made by Trustee Hofmann and seconded by Trustee Feagans to approve report. Report approved and filed into record. The minutes from the May 21st, 2018 board meeting were reviewed by each board member. A motion made by Trustee VanCleve and seconded by Trustee Feagans to approve the minutes with the correction. Minutes approved and filed in record. 1. Discussion was had on the update for a projected start date for the War Memorial being in August. Discussion had on the sidewalk and possible dedication date. 2. Discussion had on upgrading street lighting to LED lights, as per Ameren it is $250 per light to have replaced and Greenview has approximately 87 lights or they will replace for free when a light goes bad. Still checking on other possible incentives. 3. Discussion had on board members purchasing polo shirts at their expense with the Village logo on them. 4. Discussion had on size of a sign for our E-commerce zone. 5. Trustee VanCleve has spoken with the County on replacing street signs and as of now there are no programs through the County to replace the street signs. Will also check with the Village Engineers to see if there is a different program. Trustee Hofmann: Park Committee had meeting and will placing the savings thermometer in the park soon. They have several money raising events coming up. Asked if the Village would be ok to block streets for a Bag Tourney in August and a Car Wash in July. President Horn: Advised that the notice to sale properties went into the paper and will have a bid opening at the June 18th meeting. Advised board members that the Village has the right to refuse any bids they feel are not in the best interest of the Village. Discussion was also had on the sale of the 1 ace that is owned by the Village. At the conclusion of all business, the announcement of the next meeting was made. The next meeting will be held on Monday June 18th, 2018 at 7:00 pm.